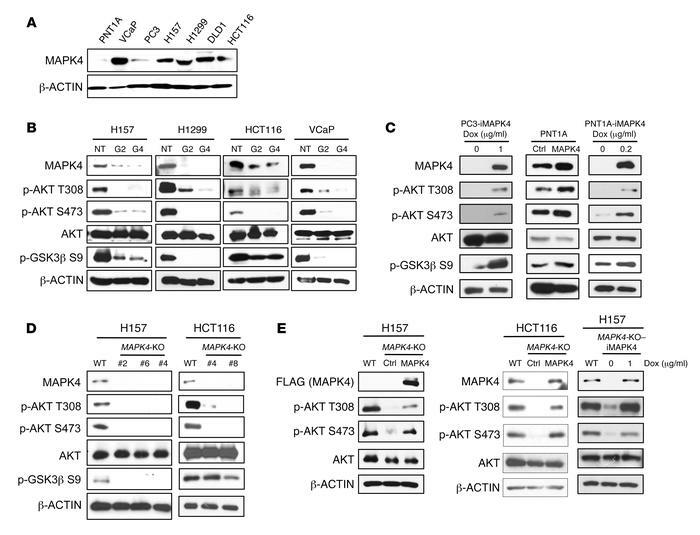 (A) Western blots on MAPK4 expression in various human cancer cell lines and PNT1A, an immortalized human prostate epithelial cell line. (B) Two distinct shRNAs targeting MAPK4 (G2 and G4 as described in Methods) were used to knock down MAPK4 expression in H157, H1299, HCT116, and VCaP cells. Western blots were used to detect AKT phosphorylation and activation (phosphorylation of GSK3β). (C) MAPK4 was overexpressed in PC3 and PNT1A cells. Western blots were used to detect AKT phosphorylation and activation. (D) CRISPR/Cas9 technology was used to knockout MAPK4 in H157 cells (clones 2, 4, 6) and HCT116 cells (clones 4 and 8). Western blots were used to compare AKT phosphorylation and activation among these cells. (E) MAPK4 was ectopically expressed in the H157 MAPK4-KO cells (clone 2) and HCT116 MAPK4-KO cells (clone 4). Both constitutive and Dox-induced expression systems were used to express MAPK4 in the H157 MAPK4-KO cells. Western blots were used to detect AKT phosphorylation and activation. Ctrl: control; NT: nontargeting control; iMAPK4: Dox-inducible overexpression of MAPK4. Data are representative of at least 3 independent experiments.